Posted on Wed, Jan 18, 2012 : 10:55 p.m.
Gov. Rick Snyder drew mixed reactions from local lawmakers following Wednesday's State of the State, but it appears there's some support for his transportation-heavy agenda. Among the issues Snyder hopes to tackle in 2012, the Republican governor cited finding an extra $1.4 billion in annual funding for roads, expanding regional public transit services in Southeast Michigan and building a second bridge from Detroit to Canada. "He's continuing to use my number of $1.4 billion in additional funding that we need to maintain our roads, so I see that as a good sign," said state Rep. Rick Olson, R-York Township, who plans to introduce the first piece of legislation on that next week. State Rep. Jeff Irwin, D-Ann Arbor, said he thought Snyder's speech was filled with a lot of pleasantries and platitudes, but he liked some of what he heard on transportation. State Rep. Mark Ouimet, R-Scio Township, speaks with reporters following the State of the State address in Lansing. "Some of those ideas are good ideas," he said. "I've been working on trying to expand public transit opportunities and improve our roads for a long time. It's a great priority." Irwin criticized Snyder for not laying out a more specific plan. "He did a little two-step there at the end," he said. "He laid out some of these broad good concepts and then he said, 'And I want to start a conversation on that.'" State Rep. Mark Ouimet, R-Scio Township, said he was happy to hear Snyder share good news regarding the state's unemployment rate and he supports the governor's agenda for 2012. "I think it was right on," he said. "The governor has a clear idea for our cities to be successful. We've got to have a mass transit plan and then match that plan with funding." Ouimet said he had to give Snyder credit because some of the ideas he's talking about are not universally popular. "But I think he clearly understands it," he said. "So for Detroit to be successful, I think we've got to have mass transit in Detroit and around Detroit." Olson agreed a regional transportation authority for Southeast Michigan, which Snyder supports, is needed. Irwin asked Olson about that after the speech. "Does the fact that when the governor talked about transit and, as far as I know, none of your colleagues stood and clapped at that one piece, is that indicative that there's no opportunity for bipartisan compromise on that issue?" Irwin said. "No, I think there will be," Olson responded. "For a lot of Republicans, transit is just not as big an issue. Let's just face it, because a lot of them aren't in the more urban areas." Bipartisan support also is needed on the bridge issue. 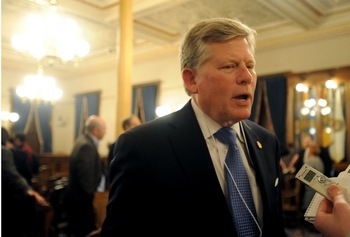 State Rep. Jeff Irwin, D-Ann Arbor, talks to a reporter after the State of the State address. "Obviously that's somewhat controversial," Olson said. "But if we can get it to a point where no state taxpayer money is used to build a bridge or bail out a new bridge authority, I'm OK with that, so hopefully we can do that because all that means jobs." Olson said the 13-bill package he and other lawmakers are planning to introduce next week to raise new funding for roads in Michigan will need bipartisan support, too. Snyder spoke of the need to raise $1.4 billion in additional road funding last fall and cited some examples for how to get there. Some of those ideas have been tweaked, Olson said. "Instead of his example of eliminating the gas tax and putting in a revenue-neutral sales tax at the wholesale level, the bill that I will be introducing myself — instead of being revenue-neutral — will bring in something over $500 million," he said. "That's real money." And instead of Snyder's example of an increase in vehicle registration fees by $120 per person per year, that's ratcheted down to bring in about $500 million, Olson said. "Instead of the flat dollar amount, we put in a percentage increase," he said, "so that the people who are driving lower-valued vehicles would have a percentage increase but the total amount is not going to be as big as those people who own real expensive vehicles." As for a regional transit authority, Irwin said he's on board with the concept but he'll need to see the details and how it fits with the Ann Arbor Transportation Authority. 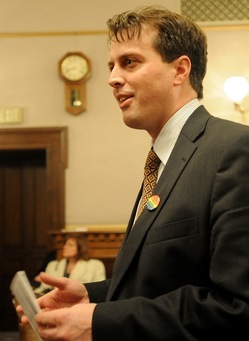 "We need to see how Washtenaw County is treated in the relationship," he said. "We also need to see how our transit agency is going to be treated in the relationship because AATA does a very good job with what they do. We don't want to create a situation where they may be sucked into some of the problems that are happening across the 8 Mile divide." Fri, Jan 20, 2012 : 3:56 p.m.
Let business off the hook, give them free a free ride on our roads and pass on the costs to the individual taxpayers. Then when their overloaded trucks destroy the roads in a few years, add some more taxes on to the private citizens. Some of what Rick said was good, but my income taxes are already going up $1200 next year and they would go up even more if I had a pension. Meanwhile he cuts business taxes by $1.8 B and refuses to put a tax on these trucking companies that are destroying our roads. These tax increases on individuals are what really hurts the economy by holding down demand for goods and services which in turn, stops business from hiring more people. When you tax business, this tax is passed on to all who use this business, which eventually gets down to the individual but at a much smaller increase than adding $120 to my vehicle registration. Sorry Rick, your big business backers don't need any more favors, we the people of Michigan need the favors. How is the recall doing? Fri, Jan 20, 2012 : 2:30 a.m. Some may remember that Swainson was quite the transportation-minded governor. Thu, Jan 19, 2012 : 9:44 p.m.
Tax cuts for businesses, tax hikes and fee increases for individuals. Thanks Governor! Thu, Jan 19, 2012 : 2:29 p.m.
Synder says he will find the money to rebuild roads. Its already found and will come in the way of taxation and fees on the citizens of Michigan. Commerce depends on quality infrastructure to deliver goods. Investing in the infrastructure of our fair state is always a good idea. Sometimes greed gets in the way of makproviding the best benefit the citizens of our state and nation. Providing a means to move people and products should be a major function of the government(i.e. interstate highway system). Glad to see the investment &amp; it'll provide construction and engineering jobs to state workers. Whoops, did I say that government spending is a good thing? Thu, Jan 19, 2012 : 1:03 p.m.
&quot;As for a regional transit authority, Irwin said he's on board with the concept but he'll need to see the details and how it fits with the Ann Arbor Transportation Authority.&quot; Good point. Why complicate matters even more by dissolving the AATA into the proposed county-wide authority? City and county leaders should wait to see how the regional authority might come together. Maybe the new regional authority could even help Conan Smith get to his office in Royal Oak? For those Ann Arborites commuting out of town to work like Smith, buses headed for metro Detroit make much more sense than buses headed for rural Washtenaw county. Thu, Jan 19, 2012 : 12:20 p.m.
Until diesel trucks carrying heavier loads than any other state pay the same fuel tax rate as the rest of us, I don't want to hear about new taxes. Last time the fuel tax was raised, the &quot;best owned legislature&quot; in the U S, at the last minute exempted diesel. These are the vehicles that cause the most damage to the roads. Thu, Jan 19, 2012 : 11:29 a.m.
&quot;How much will Ouimet bill his expense account for showing up?&quot; At least Mark Ouimet paid back what he owned the County eventually. Whereas Conan Smith and others haven't. Thu, Jan 19, 2012 : 4:45 a.m.
Fri, Jan 20, 2012 : 3:40 p.m. The Canadians will ante up if the state does the job too. Isn't building a bridge a revenue source for the state? Why should we make some company rich when the state could use the revenue? Please don't say that the state will not do as good a job running the bridge as a private company, we have done pretty well with the Big Mac. Why should an international border crossing be controlled by a private company? I was shocked and dismayed when I discovered that the current bridge is owned by some lunatic billionaire. That's just crazy. It should be publicly funded and controlled. A private for-profit company will never have the interests of the people in mind.